The Supreme Court required the Attorney General's office to decide soon whether or not to file charges against the judges of the private, ultra-Orthodox rabbinical court who issued an excommunication notice to a Haredi resident Elad who are also suspected of blackmail, threatening private citizens, and obstruction of justice. On Monday, July 18, 2016, at a Supreme Court hearing for a petition submitted by Hiddush and a resident of the ultra-Orthodox city of Elad, the Justices ruled on the matter of writs of refusal (excommunication notices) issued by private rabbinical courts. A private rabbinical court of Elad, enjoying the imprimatur of the state salaried Chief Rabbi of Elad, issued the writ of refusal against Hiddush’s client. Her “sin” was turning to a civil court for an injunction against her upstairs neighbor. Unsurprisingly, the rabbinic court viewed this as heretical, for they hold that Israel’s civil courts and law are illegitimate. 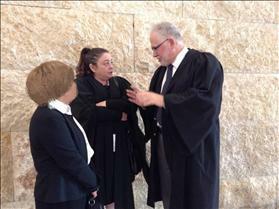 Private rabbinical courts operate under Israel's Arbitration Act. Their authority derives from the consent of all parties to appear before them, and they have no authority over those who do not seek their services for arbitration. By law, they are not permitted to coerce or force parties into seeking legal arbitration through them; they are not permitted to impose penalties or pressure parties to refrain from turning to the civil courts or seek remedy ensured to them under Israeli civil law. The Ministry of Religious Affairs' legal advisor's guidelines require private rabbinical courts to emphasize (with every subpoena) that they do not have governmental authority, and arbitration before them is only conditional upon the will of all parties involved. The guidelines also establish that "there is a total ban against the use of governmental trappings [by private rabbinical courts] ... for fear of misleading the public." The Supreme Court ordered the Attorney General's office to decide soon whether or not to file charges against the judges of the private, ultra-Orthodox rabbinical court that issued the excommunication notice, which is also suspected of blackmail, threatening private citizens, and obstruction of justice. Hiddush's petition prompted the Attorney General to publicly clarify, and the Court to further emphasize during the hearings on the case, that writs of refusal by which ultra-Orthodox private rabbinical courts coerce individuals to appear before them, rather than the civil courts, are illegal. The hearing ended with the justices embracing the attorney general's position that writs of refusal issued by private courts are illegal. Hiddush's petition was filed to remedy an injustice, but no less importantly to eradicate the vile phenomenon of writs of refusal and prevent their return. These excommunication notices result in community-wide ostracism of those who turn to Israel's civil courts for justice, rather than the private ultra-Orthodox rabbinical courts. The Court adopted the Attorney General's positionl, which held that writs of refusal are illegal, and under certain circumstances, the rabbis who issue them are thus committing criminal offenses, such as extortion and obstruction of justice. A criminal investigation was launched against the the judges of the City of Elad's "Central Rabbinical Court for Monetary Matters - the True and Righteous." The Supreme Court praised the petitioners for bringing the egregious problem of writs of refusal to the surface, resulting with the Attorney General issuing clear guidelines that prohibit any further issuances of such writs, and unequivocally label them as criminal and subject to State sanctions. The Justices also stressed the improper nature of the relationship between private ultra-Orthodox rabbinical courts and State/Municipal authorities such as the Chief Rabbi of Elad and the municipal facilities. The Justices further added the expectation that the criminal investigation and process would soon come to a conclusion, and it would be decided whether to file criminal charges against those involved in the issuance of the illegal excommunication notice, such as for offenses of blackmail, threats and obstruction of justice. Hiddush, of course, will continue to diligently monitor the conduct of such ultra-Orthodox private rabbinical courts to ascertain they cease threatening the public, and do not commence issuing these threatening “writs of refusal” disguised in different dress. Hiddush's petition was filed to remedy an individual injustice, but no less importantly to eradicate the vile phenomenon of writs of refusal that threaten Israel’s rule of law and represent the danger of maintaining “a state within a state” in the name of religion. New polling reaffirms Hiddush finding.